Twin blade main rotor and tail rotor spin 360 degrees. UH-1D "Slick" armed troop transport helicopter includes poseable left and right door gunner machine guns mounted on the M23 armament system. Additional details include landing skids, tail boom with vertical fin and rear wing, sliding cargo doors open, pilot and co-pilot seating and flight controls. Printed step by step building instructions with U.S. insignia decals and squadron markings of the U.S. Army 1st Cavalry Division (Airmobile). 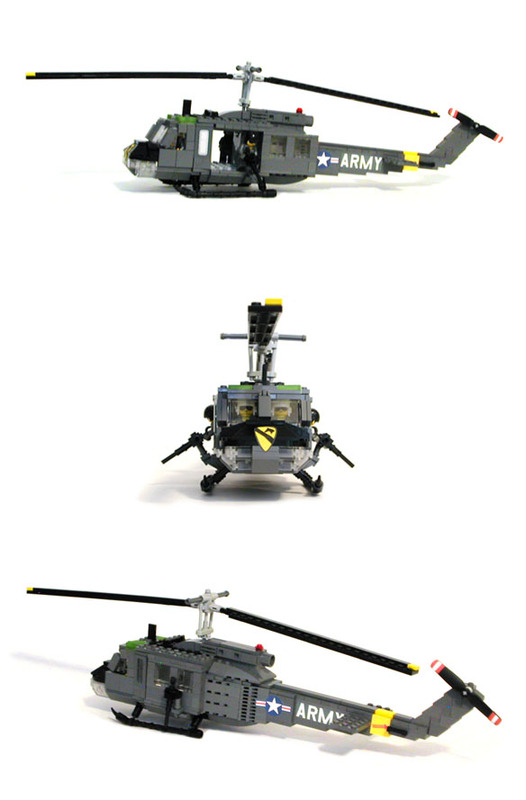 Includes pilot, co-pilot, and two door gunner minifigures.